ktMINE will be a sponsor at IAM’s ninth IPBC Global, the world’s leading event focusing on the business of intellectual property value creation. 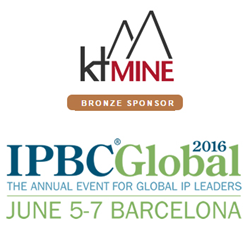 ktMINE, an innovation and intellectual property information services firm, announced today that they will be a bronze sponsor and exhibitor at the Intellectual Property Business Congress (IPBC) Global 2016, taking place in Barcelona, Spain, from June 5th to June 7th, 2016. It will be the ninth IPBC Global, the world’s leading event focusing on the business of intellectual property value creation. ktMINE’s David R. Jarczyk, President and CEO, and Michael Taylor, Chief Technology Officer, will be representing ktMINE at booth 8 in the prestigious Hotel Arts. ktMINE presents the only all-in-one search of intellectual property connecting datasets to create powerful insights. ktMINE’s tools expedite the research of many business professionals including those in licensing, intellectual property, business development, competitive intelligence, transfer pricing, legal, and valuation. Intellectual Asset Management (IAM), the world’s leading IP business media platform, will be hosting IPBC Global and assembling a high-level faculty of speakers from corporate, financial, intermediary and legal sectors. Bringing together chief IP officers, NPEs, policy makers, academics, private practice lawyers, patent and trademark attorneys, and other service providers, to discuss cutting-edge IP issues. The event will take place during a time of continuing evolution in the international IP market. Topics will include legislation and regulatory developments, CIPO challenges, collaborative model and the integrated approach, building quality patent portfolios, the Alice effect, FRAND futures, and more. ktMINE, headquartered in Chicago, IL, is an innovation and intellectual property information firm founded in 2008. Focused on mining, organizing and connecting the world’s IP information, ktMINE provides businesses across the globe access to insights on industry players, technologies, and developments. For more information visit http://www.ktmine.com, or contact ktMINE to schedule a meeting.